The number of survey responses received from different regions ranges from 64 from Sub-Saharan Africa to 330 from Europe. For stakeholder groups the range was from 88 from international organizations to 471 from business. 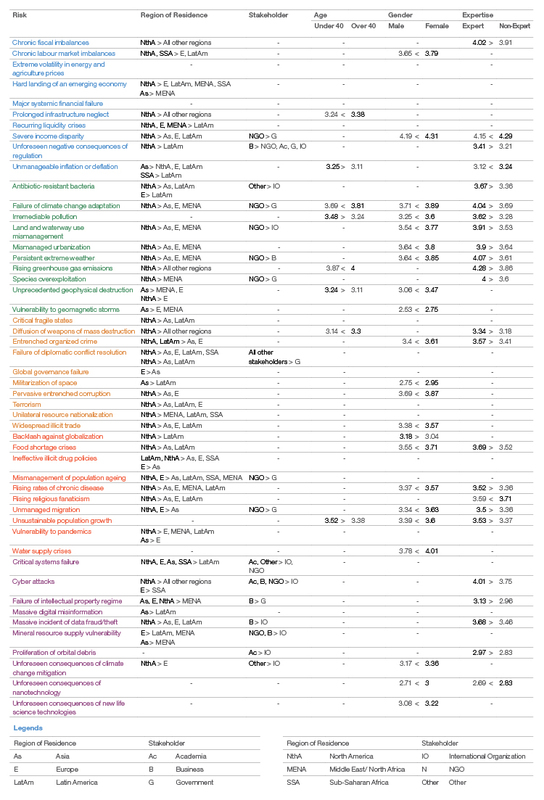 As illustrated in Table 1xlviixlviii, out of 50 global risks, only two risks – extreme volatility in energy and agriculture prices and major systemic financial failure – did not have any statistically significant differences between any groups. The other 48 risks had at least one group difference. Arguably the risk with the most differences, especially between regions, was failure of drug policies. Only eight out of 50 risks had statistically significant differences between respondents under 40 and over 40 years of age. Four of these risks were in the environmental category: failure of climate change adaptation, irremediable pollution, rising greenhouse gas emissions, and unprecedented geophysical destruction. Similarly, the environmental category had the largest percentage of risks with statistically significant differences between experts and non-experts. Where there are differences, generally experts perceived the risk as more likely to occur, though non-experts found four risks more likely: severe income disparity, unmanageable inflation and deflation, rising religious fanaticism and unforeseen consequences of nanotechnology. Interestingly, rising religious fanaticism was one of the most highly connected risks in the Risks Interconnection Map. Finally, where there were statistically significant gender differences, females were more pessimistic and rated the risks as more likely to occur. The biggest difference between male and female opinions was regarding the risk of unprecedented geophysical destruction, with a difference of 0.41 (on a scale of 1 to 5). 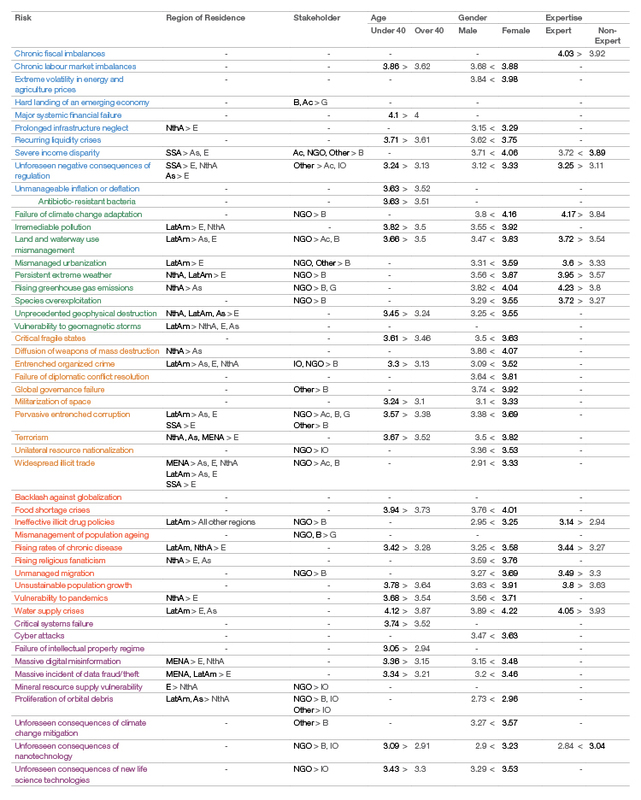 In terms of perceived impact, regional differences were found for 48% of the risks, with the most differences found in the environmental category and the least in the economic category (see Table 2lixlx). Where there were statistically significant differences, respondents from Latin America perceived 50% of these risks as having higher impact than did respondents from other regions. Apart from the risk mineral resource supply vulnerability, European respondents generally perceived risks as having lower impact. Among stakeholder groups, statistically significant differences were found for less than half the risks, with NGOs perceiving impacts to be higher and businesses lower. There were two exceptions: hard landing of an emerging economy and mismanagement of population ageing. Between respondents under and over 40 years of age, there were statistically significant differences for half the risks, with younger respondents perceiving higher impact. The largest difference, 0.32 units, was for irremediable pollution. Male and female opinions differed significantly for 39 out of 50 risks, most obviously in the geopolitical category, with all 10 risks having differences. In all 39 cases, men perceived the impact of the risks as lower, with the largest difference, of 0.43, for entrenched organized crime. Fewest statistically significant differences were found between experts and non-experts – only 15 risks, none in the geopolitical category and only one in the technological category. Where there were differences, experts generally rated risks as having a higher impact, except in the case of two risks: severe income disparity and unforeseen consequences of nanotechnology. Table 3 shows the average likelihood and impact scores and their margins of error (based on a 95% confidence level). The larger the margin of error, the lower the confidence that the result is close to the “true” figure of the whole survey populations (see Appendix 1). xlvii An analysis of variance (ANOVA) tested whether or not the means of sub-groups were all equal. For those risks where they were not all equal, a Sidak post-hoc test established which of the pair-wise differences between groups were significant at the 5% level. xlviii Only statistically significant differences are noted; otherwise, the table cell is empty. lix An analysis of variance (ANOVA) tested whether or not the means of sub-groups were all equal. For those risks where they were not all equal, a Sidak post-hoc test established which of the pair-wise differences between groups were significant at the 5% level. lx Only statistically significant differences are noted; otherwise, the table cell is left empty.